Something Eternal is my third, and most likely last time entering the Kindle Scout campaign. It's hard to tell if I'm getting closer to winning or farther away. I've done everything imaginable. I've planned a three-week book blog tour four months in advance. I've promoted the heck out of Kindle Scout as a program. I've built a rather decent list on Facebook. I'm connected on Pinterest, Twitter, and Goodreads. I've contacted people personally. I've had book clubs and small publishers contact me during the campaign, but still, when I look at my campaign stats, I wonder if it's enough. I try to stay positive and focused, but this nagging in my gut, which is kind of a big deal since I was recently diagnosed with stomach cancer, wonders if I'll taste success just once. I know that if Something Eternal is given a shot, it would be one of Kindle Scout's best sellers. I know what I wrote, and a few other people with literary backgrounds have seen it, and they agree, I'm not delusional, not about Something Eternal anyway. I know certain people figure if a person doesn't win the Kindle Scout, said person will just release their book anyway. Well, I'm here to tell you that's not the case with Something eternal. I didn't release Dwellers after it didn't win, and I certainly won't release Something Eternal to anyone either. I feel that Something Eternal is destined for greater things than the 0.99 cent bin somewhere, and if it's not, I'm okay, I suppose, with not releasing it. There's been a lot of people that have come forward--strangers, that have approached me about reading Something Eternal. To those fans out there, you honor me by seeing the same vision as I do for Something Eternal. Whenever you send me an email, IM, or just comment on a site, I smile...it brings me joy to share more than just a book, but an experience. I almost forgot. If you haven't already, please nominate Something Eternal, share it with your friends and family, heck, share it with people you hardly know, you might get to know them a little bit better, too. Remember, those who vote, get their name in the "Thank You Page" should Something Eternal win Kindle Scout. And above everything else, thank you. 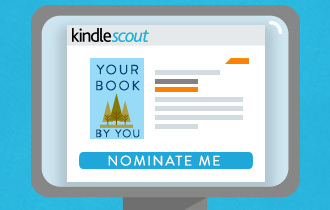 Click the picture, (left) to see a short video about how Kindle Scout works.